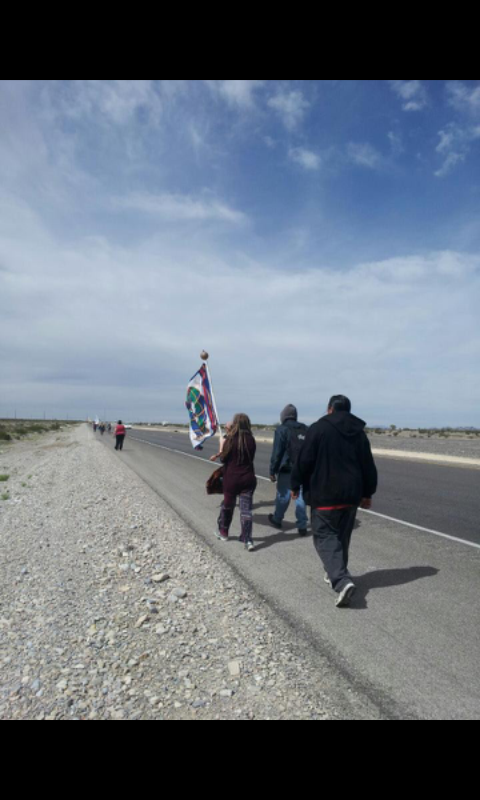 Walking in prayer, the Sacred Peace Walk began at the National Atomic Testing Museum in Las Vegas and continued through traditional Western Shoshone homelands to the Nuclear Test site. "The Nuclear Test Site is on Western Shoshone land, under the 1863 Treaty of Ruby Valley," said Western Shoshone Buck Sampson, whose son Carl walked on the 60-mile annual walk this week. "This is what I learned back in the '80s, Sundancing. Every step is a prayer, and every prayer is to the Creator, Sundancing in the old ways," Buck said. The Sacred Peace Walk concluded with a sunrise ceremony and prayers by Western Shoshone Spiritual Advisor Johnny Bobb. "Johnny Bobb is the leader for the Indian walkers," Buck Sampson said. Buck said Johnny Bobb is responsible for issuing permits to non-Indians who cross the boundary into Western Shoshone territory of Yucca Mountain. Johnny Bobb serves as Chief of the Western Shoshone National Council. 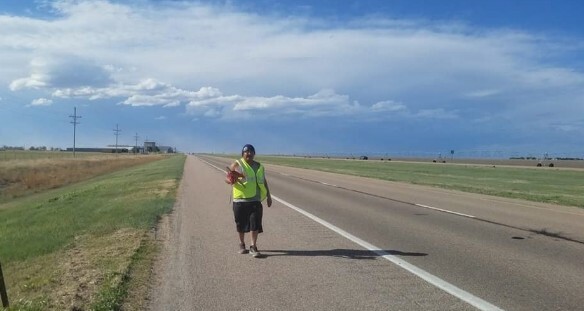 Sacred Peace Walker Carl 'Bad Bear' Sampson has walked on the Native American Longest Walks 2, 3 and 4 across America and documented the walks as a photojournalist for Censored News. "Walking on these walks is praying. Prayer is knowledge and knowledge is power," Carl said. The US Nuclear Test Site is a harbinger of horror which resulted in global atrocities and mass destruction for mankind. Further, Western Shoshone, US military, and Southwest residents were exposed, unprotected, to radiation and fallout. Above ground nuclear testing began here in the early 1950s. The mushroom clouds became a symbol of the widespread disease and death that resulted. Those images were a symbol of the United States disregard for all life, including the Western Shoshones, whose land, water and air were poisoned with radiation. Sacred Peace Walkers walked in prayer to sacred Yucca Mountain, where the Nuclear Test Site is located. Yucca Mountain was targeted earlier for a US nuclear waste dump. The Sacred Peace Walk offered prayers of healing and prayers for the unity of mankind. Western Shoshone Carl 'Bad Bear' Sampson, shown in the photo with the buffalo above on the Sacred Peace Walk, has provided Censored News with photos of the Longest Walks 2, 3 and 4 as he walked across America. Thank you!